Take your picks from the descriptor grab bag: Honey, Gold, Drop, Sun, Bunch, etc. Now put a couple of them together and you might end up with a luscious-sounding name for a tomato variety. People have done this, and reeled me right in. This year I got fished into planting a few, new (for me) varieties of cherry tomato. Sungold is the gold standard of cherry tomatoes, the one I always grow. Its rich aroma underlies a sweetness livened with just the right amount of tang. One problem with Sungold is that it’s an F-1 hybrid, which means that you can’t save the seed and expect the resulting seedlings’ fruits to have the flavor of Sungold. The flavor might be better, but it’s more likely to be not as good. The other problem with Sungold is that the seeds, which must be purchased, are expensive. 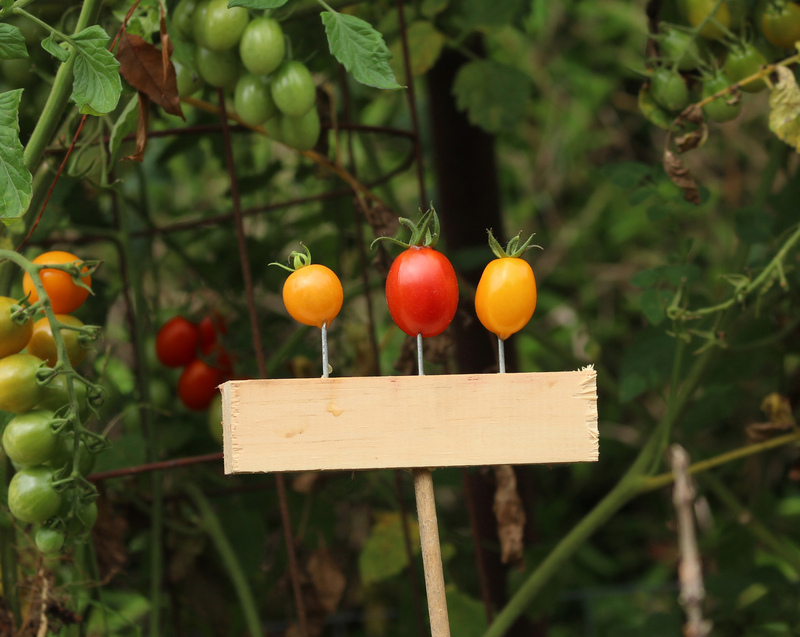 The first of this year’s lineup was the variety Solid Gold, a yellow, teardrop shaped tomato. Like Sungold, it’s an F-1 hybrid. Perhaps it would offer better or different, but also excellent, eating. It has been billed as having “outstanding flavor of true grape tomatoes” (by those selling the seeds). Grape tomatoes are tiny tomatoes, a different species from other tomatoes, with very good, very sweet flavor. Honeybunch, the second in the lineup, is another F-1 hybrid, this one red and teardrop shaped. “As if a pearl tomato(?) had been drizzled with honey,” so they say. The flavor of another variety, Honey Drop, was likened to that of honeydew melon. This one’s a Sungold look-alike and is open-pollinated, so seedlings should generally yield the same fruits as the parent. All three of these new varieties have borne early, and their stems have been heavy all season long with beautiful golden or red fruits. One reason their stems are so laden with fruits is because we don’t pick them. Not when we also have Sungold tomatoes to munch on. Solid Gold, Honey Bunch, Honey Drop, and the unnamed variety are all very good tomatoes, but why eat a very good tomato when you can eat the best tomato? Moving out into the field, literally, to my filbert (hazel) nut bushes . . . East of the Rocky Mountains, most people who plant filberts, and especially permaculturalists, plant American filberts (Corylus americana). This species is resistant to eastern filbert blight, a fungal disease endemic in these parts. I once grew American filberts, and they are beautiful in fall when their leaves turn blazing shades of red. Unfortunately, their nuts are small, with bad flavor — a good wildlife food, a poor human food. European filberts (C. avellana), and various hybrids, are what yield the large and tasty nuts of commerce. Orchards of these filberts are mostly in the Pacific Northwest. 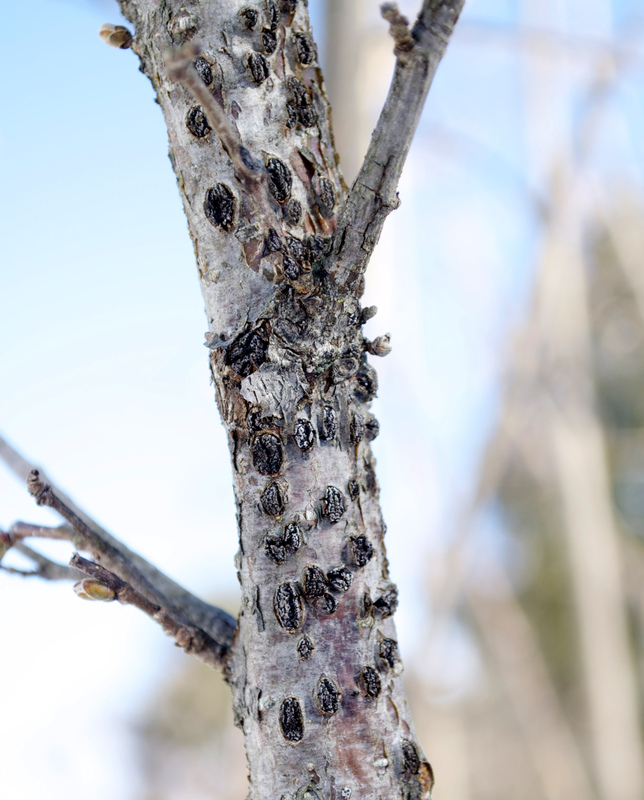 About 50 years ago, Eastern filbert blight made inroads to those orchards, which prompted breeding programs for blight-resistant varieties. I’ve planted a number of blight resistant filbert varieties, including some older varieties bred decades ago in the East. As it turns out, though, the the blight fungus exists in more than one regional strain; like some other fungi, the blight fungus might also morph over time. Join me as I walk my row of filberts and note the performance of the various varieties. Four of the plants are only in their second year and are from the New Jersey breeding program of Tom Molnar, at Rutgers. The hope is that they’ll be more blight resistant than the western-bred varieties. The worst of the older plants include the varieties Clark, Eta, and Hall’s Giant. 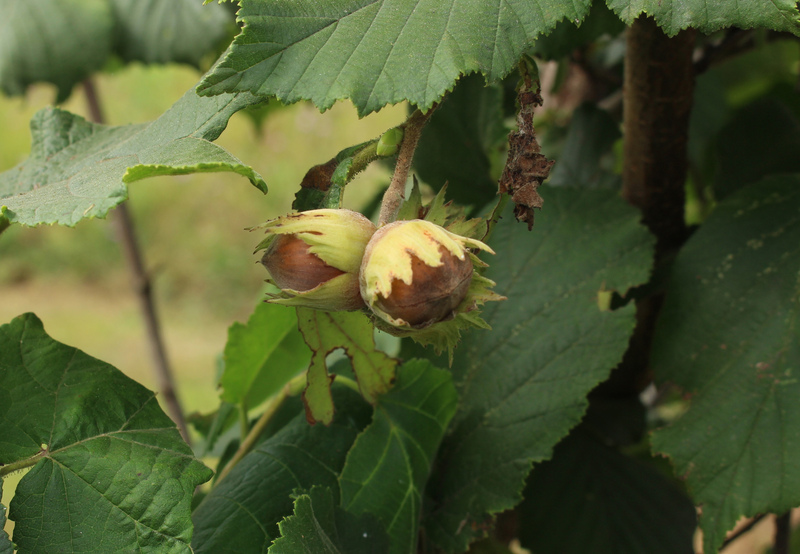 Clark and Eta are western-bred, while Hall’s Giant is an older, easter-bred variety that is bearing a moderate number of good-sized nuts in spite of the blight. Santiam, from the west, is afflicted with a moderate amount of blight. The nuts it bears are small but still much larger and tastier than native American filberts. Least blight-infected are the western varieties Lewis and Yamhill, the Italian variety Tonda di Giffoni, and Graham, an older, eastern variety. Thus far, my favorite is probably Graham, a hybrid of American and European filberts bred by Samuel H. Graham of Ithaca, New York, and introduced in 1950. It yields the largest nuts of the lot and shows its American parentage in its wide suckering growth habit and the fiery red of its leaves in autumn. As they say in ads: “Your results may vary.” The above are my experiences. Filbert blight, like any disease, only thrives with suitable environment, a susceptible host, AND presence of pathogen. My farmden fulfills all three conditions, with varying host plant susceptibility. But I only am growing one plant of each variety; slightly different conditions might affect susceptibility of individual plants. Now, about my cherry tomato experiences: Tomato flavor varies little with climate or growing conditions, so your results probably would NOT vary from mine. Except of course, that it’s surely a matter of taste when it comes to taste. This entry was posted in Fruit, Gardening, Planning, Vegetables and tagged cherry tomatoes, corylus, filbert blight, filberts, hazels, Sungold. Bookmark the permalink. Trackbacks are closed, but you can post a comment. Sungold has also been our go-to cherry variety ever since we started gardening, but I’m also interested in branching out. Have you tried to grow Igleheart Yellow Cherry in our region (I’m in Poughkeepsie), which won at this year’s SSE tasting and has done in the past as well? Or have you tried Black Opal or Black Cherry? I’ve heard good things about both. Having been disappointed many times, I’m reluctant to devote space to trying new varieties. In practice, though, I usually can’t resist. Perhaps I’ll try one or more of the varieties you mention for next year. I have the same affliction with finding it hard to resist planting new trials. This year I tried Cherry Roma. Tastes bland off the vine, but deliciously sweet when oven-roasted (and presumably when dried). Same results with Principe Borghese several years back. The other cherry that caught my eye this year, which I may plant next year, is Indigo Cherry Drops. It’s one of the new “blue” varieties with high anthocyanin. Early reports were that most of the blues really suffered in the taste department, but this might be the first delicious blue. So far it’s on the short list. Let us all know how Indigo Cherry Drops taste so only one of us — you — need to risk it. Sungold may be an F1 but you could stabilize it by saving seeds, planting them, selecting for the same characteristics as Sungold and repeating the process until you get a stable Sungold. People have tried this but none of the progeny, as far as I know, has matched Sungold’s quality. Still, what you suggest is surely still a possibility. I planted one Lewis and one Clark in my previous front yard near Atlanta, and after 5 years, never saw a single nut. But the plants were vigorous, 8 ft tall, bushy and disease free … just an observation. I hope the current owners get something from them eventually. …..been growing Sungold for 15 plus years and feel that it has been consistently declining in size, hybrids need to be “reselected” periodically, right? I haven’t noticed any decline in Sun Gold over the years. Anyone else want to weight in? Hybrids should not need to be reselected periodically because every year the seed is made anew by crossing two presumably stable parents (parent tomatoes, that is). I wholeheartedly agree. Anything that’s not Sungold is usually a waste of space. I’ve given up planting any other variety. No, I haven’t tried Compari. I’m wary about trying any new (for me) varieties because I’m most interested in great flavor. Blight doesn’t worry me so much; crop rotation, a good site, thorough cleanup, etc. keep it sufficiently under control. Also, even if it is blight resistant, that’s not to say that other diseases wouldn’t be a problem. We grew Compari tomatoes this past Fall (2018) from seeds my husband saved from a pack of organic “Campari” or “Compari” salad tomatoes he bought at the grocery store. Even in our nematode-infested soils, these were the earliest and most prolific tomatoes we harvest this fall. Nice clusters of beautiful, very sweet, large cherry with a nip shaped fruit with no blemishes, on a healthy, compact (under 5 ft tall, and not sprawling) plant with no foliar diseases (in Fall planting – haven’t tried them in Spring to Summer yet). Ours are still cranking out tomatoes for us in late January (we cover them well when frost or light freeze is expected – one layer of agribon, with tarp over if temps expected in the thirties). A really great tomato! Get some at the grocery store and grow some out yourself; nearly EVERY seed germinated. Our grow-out fruits seem slightly larger than the grocery store version, but that may be due to how I prune them, or our micro-climate field conditions. The best of our compari transplants was one I planted at the base of a column that holds up our solar panels; it had full southern sun exposure, but a bit of overhead protection (from the solar panel above and to the north of it) from rain, cold, etc. Next we need to find a leaf mold and nematode resistant PASTE tomato 🙂 Any suggestions? San Marzano, for me, seems to be resistant to a lot of tomato ills (although I don’t have nematode problems). It’s also one of the best tasting paste tomatoes — cooked; it tastes awful fresh.